In many ways, Japan still remains a mystery to the rest of the world. For here, the ancient and the modern not only coexist but seem to do so in great harmony. The land of the rising sun is as comfortable with its bullet trains and cutting edge technology as it is with Zen and Geishas. Japan has a unique culture, with its own peculiarities and quirks that seem natural to the Japanese but intrigue all foreigners. It's Autumn in Japan right now, and the country is ablaze with color. 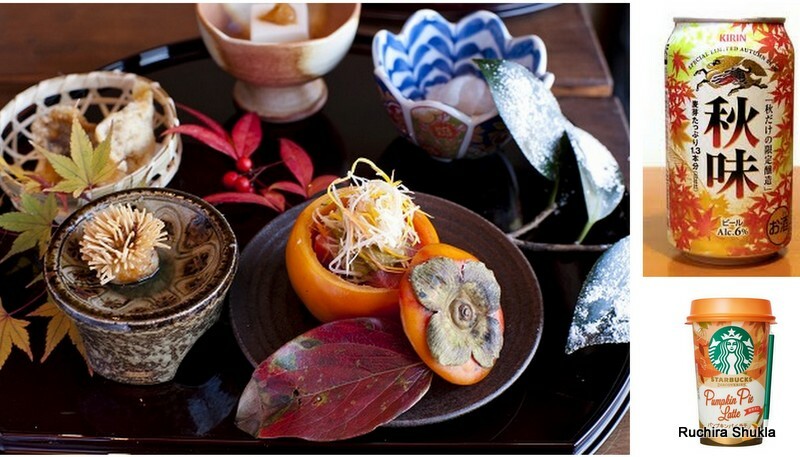 Today, In the Japan and I series, I talk about Japan and how it celebrates Autumn. The time I miss Japan the most is during Autumn, when the trees undergo a spectacular wardrobe change, shedding their usual green to don capes of red, orange, rust and vermilion. The average Japanese associates very closely with nature and the change of seasons. Both the cherry blossoms in spring and the fall colors in autumn make the normally placid Japanese quiver with excitement. They follow the path of autumn across the island with bated breath. Weather reports on TV add a separate section on autumn forecasts and discuss the color of leaves with as much seriousness as they discuss issues of international importance. Websites like this give information about where the autumn colors are at their peak and when they have reached the ‘End of Season’ stage. Autumn starts first in Hokkaido, the northernmost and coldest tip of the country and then travels south, slowly turning the island into a palette of colors. Autumn, inspite of its mélange of colors, somehow makes you introspective. For me it used to be the best time of the year, melancholic yet very beautiful. The famed Cherry blossoms in spring signify youth and vibrancy whereas autumn leaves somehow seems to depict sadness and the impermanence of things. The way the Japanese welcome these two seasons is also slightly different. The Cherry Blossom period, which is also much shorter, is heralded mostly by boisterous sake parties held under the trees. Autumn on the other hand is a time to explore the forested hillsides and shrine and temple grounds at a more sedate, leisurely pace. Japan’s foremost religion, Shintoism has its roots in Nature. Most of the shrines in Japan are in solitary spots in mountains or their surroundings have been meticulously cultivated so that they always have spectacular natural views. The shrines are a delight to visit at any time. But during autumn they are a visual treat. Their surroundings are aflame with color, and the simple elegance of the shrine beautifully compliments the autumn foliage. Some of the most famous autumn viewing sites in Japan are in the temple town of Kyoto. The popular shrines like kinkakuji and Kiyomizudera are always choc-a-block with people taking in the autumn splendor. During weekends, people queue up to take a picture of a particularly good autumn view. Once during my annual autumn pilgrimage to Kyoto, l decided to leave the more famed shrines behind and go up to the smaller shrines higher up in the hills. I walked up the narrow path, my feet crunching on the carpet of dry red leaves, the maple leaves forming a brilliant tapestry of colors over my head. At the shrine, I sat down on a solitary bench besides a pond and just stared at the reflection of the leaves in the crystal clear water. The sky was an azure blue, but the air had the chill of the coming winter in it. In the distance the bells of the shrine rang softly, continuously. And in the sound, there was something of the autumn’s solitude. The Japanese rejoice in Nature by not only viewing it but also by incorporating it in all facets of their life. As the season changes, so does their clothing style. Scarves and jackets come out but what is more interesting is these clothes are in autumn colors like rust or orange. You will also find a lot of handbags and wallets with autumn leaves depicted on them. Shop fronts are decorated with plastic maple trees. Even the food undergoes a change. The plates and serving dishes might be decorated with red and gold leaves. Kirin, the Japanese beverage maker comes out with a special autumn version of their Beer. And it’s not just the packaging that’s different, this beer is supposed to go well with traditional Japanese autumn foods such as chestnuts. Not to be left behind, Starbucks come out with Pumpkin Pie Latte. Autumn in Japan is not just visually stunning, it’s an experience, made even more special by the unique way the Japanese celebrate the different seasons. I have always been in awe of japanese cause besides working round the clock they seem to always have a smile along with the continuous nod. Fall season mesmerizes me as well cause I am awwed by how they change colors prior to shedding their leaves. Thanks for reading Bikram ! Such lovely fall colors. Stunning! Yes they are stunning aren't they ! The different hues are beautiful. Bangalore also has trees which are covered with bright orange and pink colors and they are a pleasure to see. Oh yes they must be spectacular. Delhi has its Amaltas and gulmohar in summer ! Such a beautifully written post! It was a visual treat to see all that you have descried in my mind's eye. The pics are beautiful. I enjoy this series. Knee the posts coming! Incredibly visual. A treat for all nature lovers. And here we are, haven't seen the stars in a long long time. I know ! The pollution is not only spoiling our health but taking us away from nature ! It is so refreshing to read this post of yours.... and the images..stunning!! Japan is definitely on my travel lists and I will bother you like anything when I actually make concrete plans! You should definitely visit Japan. I know you will love it ! What a blaze of colors!! But, so funny that Starbucks has pumpkin pie latte there too! I would have imagined it would be too sweet for Japanese palates! Oh the Japanese do have a sweet tooth ! Thanks for reading Roshni ! And in the sound, there was something of the autumn’s solitude...... exactly..... listen and observe the nature and we learn a lot. Lovely pics of the leaves. I love reading your posts on Japan. Ruchira! I love this Japan series of yours. Autumn in Japan sounds very much like the one in US. Lovely pictures! Hope to visit Japan someday. Beautifully written and awesome photographs to accompany. Reading about Japan and Japanese people/culture/landscapes is always very interesting. These days my wife Vibha is working on Japanese business projects and intend to learn more about their culture and language. I would share your blog with her. Thanks a lot for reading Vijay. I hope your wife is enjoying working with Japan ! You have painted beautiful word pictures, and the photos are a visual treat too. As for the feelings evoked, i felt i was back there (been only once, and want to visit again and again!) I too am struck by the ease with which the traditional and modern blend seamlessly into each other. India too has the makings of this blend---if only we could be as disciplined!